Mini Portable Pocket Projector with 120 Inch Display is currently selling at $268.00, which is its normal price. It has a lowest price of $268.00 and is selling within its usual range. Price volatility is 0.15% (meaning it does not change often), so you might have to wait a while for the price to drop. Until then this is a recommended 'ok deal'. The current deal is also the best price on this item over the last month. 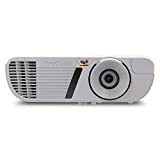 Compare the current price, savings (in dollars & percent) and Buy Ratings for the top Portable Projectors that are closely related to Mini Portable Pocket Projector with 120 Inch Display. Here is how Mini Portable Pocket Projector with 120 Inch Display compares with other leading Portable Projectors. - Connect to iPhone/iPad?1. Update HappyCast to last version: ?Open HappyCast in the desktop of this mini projector, it will automatically detect and prompt update. ?If you want to update HappyCast manually, you can open HappyCast and press the set button on the remote control,choose->setting->version update2. Make sure your iPhone/iPad and the mini projector are connected to the same WIFI. 3. Open HappyCast on the projector, and open the Airplay of your Apple device to search equipment. Click the required name of the projection equipment. 4. Close the Airplay to disconnect. -Connect to Android device? 1. Make sure your Android device and the mini projector are connected to the same WIFI. 2.Open WifiDisplay of this mini projector(Manu->WifiDisplay->click to enter into the app).The system will search the mobile phone model automatically. 3. Open the MultiScreen in the Android device, the mobile model will be searched on the projector, and then click the confirm key. 4. Close the MultiScreen to disconnect. -How to connect to the Bluetooth Device? 1. Open the manu->Setting->BT->open the Bluetooth. 2. Make sure the BT equipment can be searched by the mini projector within 10 meters3. Please note that you need to click SEARCH FOR DEVICES in the upper right corner of the Bluetooth functionSpecifications>CPU:Quad-Core1.4GHz Processer > OS: Android 4.4>Lamp: OSRAM LED lamp ?more than 3000 hours?>Contrast Ratio: 2000:1> Lamp Life Time: 30000/hours> Project Ratio: 4:3 / 16 : 9/16 : 10> Power Supply: Input AC100-240V,DC 5V 3A> WIFI: 2.4G/5G Dual-band WIFI> TF Card: Max 32G> Bluetooth: BT 4.0 > DDR: 1GB DDR3> Memory:8GBPackage List> 1 x Mini Projector> 1 x Remote Controller> 1 x Power Adapter> 1 x USB cable> 1 x Tripod> 1 x User Manual Features?BEST CHOICE?New1 mini projector offers a 34"-120" large projection screen size with projection distance 3ft-10ft, but no downscaling or compression , this pocket projector be your first choice of home entertainment, turning your room into HOME THEATER. Whether you're in search of the best pocket projectors for presentation or small business , or just want a simple machine for sharing your photo of travel/life or playing game, this pocket projector must be your best choice.?WARRANTY? 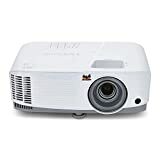 Purchasing this projector will include 1-Years warranty , professional customer service and technical support. 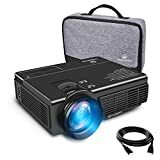 If you have any question about this mini projector, please contact with us from Amazon message for assistance, timely reply. If the pocket projector stops working within the warranty, it will be replaced as promised. ?PROJECTION EVERYWHERE?? A pico projector only 0.58lb, size as small as iPhone8P with compact and portable design is perfectly for work life and entertainment. ? Portable projector for iPhone can use HappyCast to wireless mirror you iPhone/iPad (if you are ios 11, please update HappyCast to last version),Using WIFI-Display to mirror your Android Device.? 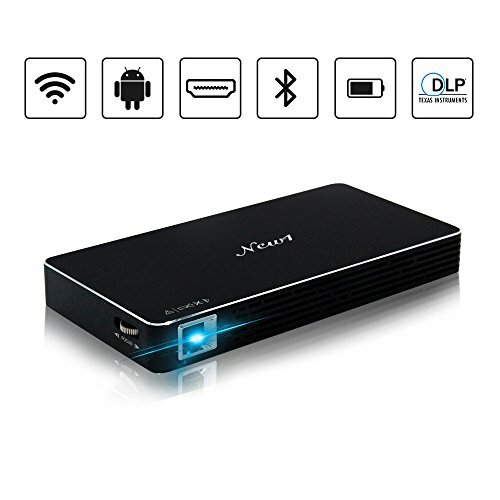 This Video Projector can connect to any HDMI-enable device(Laptop/PS4/ChromeCast etc. ), media players, USB flash drives(cable no included)?ALL FUNCTIONS YOU NEED?? A mini projector which running Android OS?it can be use like a smartphone to download Youtube/Hulu/Netflix etc., all app you want can be downloaded via built-in FreeClick & Google Play Application Store. ? Built-IN 4200 mAh rechargeable battery inside the mobile projector provide 2-3 Hours non-stop work in a single charge. ? Supporting play 1080p video resource bring you n excellent home cinema experience in dark. ? Bluetooth 4.0 for connect to external speaker.